Life does sometimes get in the way of blogging. But I have had a little time to junk and wanted to share a few fun finds with you. Above, the pic is not any good, but I got this wonderful metal rusty retro cabinet with shelves inside, and a great old green chippy sewing machine base. I usually pass on those, but this one was a beautiful chippy green. Below, Now what am I going to do with 2 red tiller blades???? I've got no idea. I had this item at the Gresham Sale, It's old rusty metal fencing made into some sort of garden art, maybe for a trellis. I just loved it. This is agreat old base to a bird bath, boy is that sucker heavy. And 2 metal things, not sure what they are for. DH wants to keep this bird house, needs a little repair, but it's great. Today I found this box of old medicine viles painted by the lady having the sale. I'm going to make them into necklace pendants. 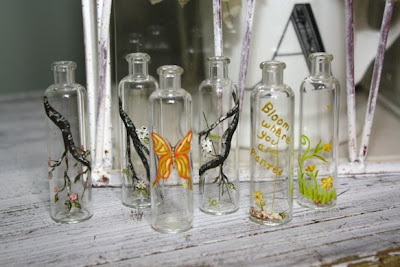 More perfume bottles and a few other trinket items. 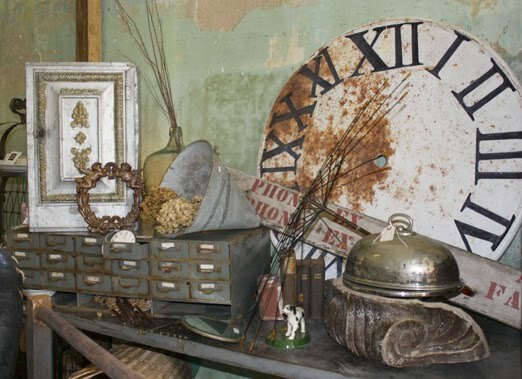 An old clock vase and some junk jewelry. Closer look at those glass viles. I love finds like this. DH has me busy this week staining our deck and power washing pollen off of everything. So off to work I go. I'm Back, don't call out the national guard just yet!!!!! It does feel good to be missed. Many other dealers have discounts and sales too, so get ready to shop. 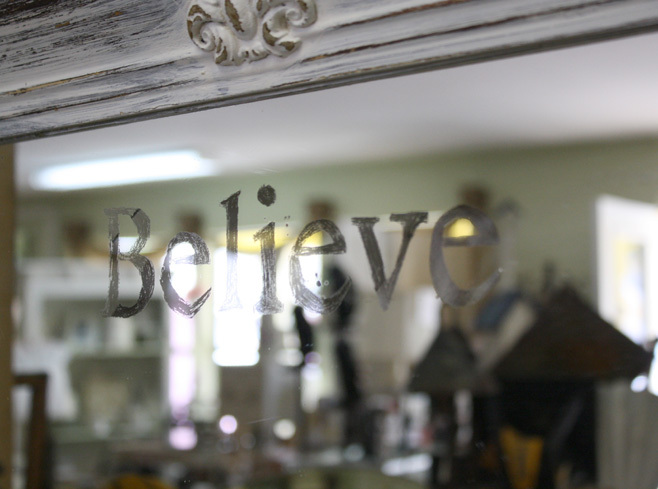 Top picture is one of my etched mirrors, I love my new camera and the shots I can get. It seems like every year at this time, the "color" gene gets turned on in my mind and I get on the search for brightly colored happy items to use and display. Thanks to everyone who helped me identify the bag in the post below that I'm loving, but it is a bit too pricey for my frugal nature. I think Robelyn may have a solution for me, we'll see. In the mean time, here is some affordable color I've brought into my house this Spring. Into the cupboard went most of my black and white items from my winter hutch display and out came the color. Fun color for working, Pencils and glasses from Michael's. Glasses are only 2.50ea and I need a pair everywhere. 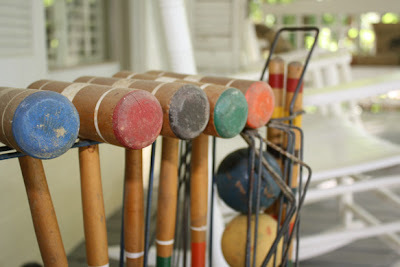 Outside there is no shortage of color, a vintage croquet set waits patiently for players. Choleus ready to be planted. Perfect color for a shady area. And this colorful display purchased as you see it from the nursery this morning. Hope you have a little color in your world as we go from Winter to Spring. In addition to the wonderful basket I found in the post below, the rant below. 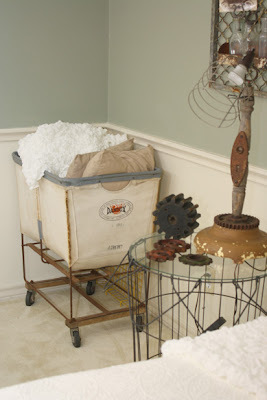 I also found this wonderful laundry cart at the barn sale. I wasn't sure how I'd use it, and for now it's in my guest fun junk room, holding extra pillows and blankets. I can think of many purposes for these wonderful canvas baskets on wheels. Jodi always finds the coolest stuff. 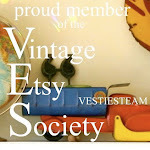 Wow, I was so touched by all of your comments regarding my Ebay rant below. It's so sad that so many of us have had similar experiences. Ebay is a great idea, but something is wrong in wonderland and someone needs to fix it. Oh how I long for the good ole' Ebay days. One more thing, I'm in love with this bag from page 76 of the May BHG I just got in the mail. Anyone know where I can find it???? 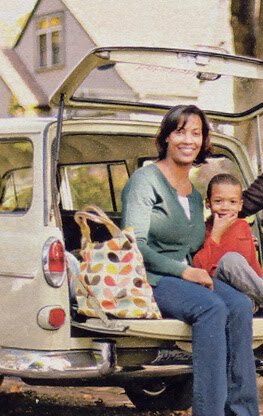 Bag identified as "Orla Kiely" by anonymous reader. Thank you. Wow these bags are expensive!!!!! I've been selling on E*bay for over 10 years. Mostly with no problems. Yes the fees are getting higher, but I can live with that. Some things just sell better on E*bay so I'm willing to pay the fees. buyers have gotten very nasty. I bend over backwards to make people happy. I work very hard to be fair in all business practices. I pack things carefully, ship quickly, and am willing to work with folks if they need time to pay. I spell out my policies clearly in my listing and follow set payment and listing rules. Even with all of this, I've had a rash of neg and neutral feedback over the past month. Mostly with no communication from the buyer. Just boom- it suddenly shows up in my feedback. Now E*bay says they've reduced my seller rating! I think the reason for this is the new policy that sellers cannot leave neg for buyers. Only buyers can leave neg. actually get paid for our items. 1) It does cost money to ship an item, The post office and other freight carriers have steadily raised their rates over the past years and we have no choice but to pass these costs on to buyers. If you want to return the item fine, but we cannot be expected to refund shipping charges that we've paid to a 3rd party. 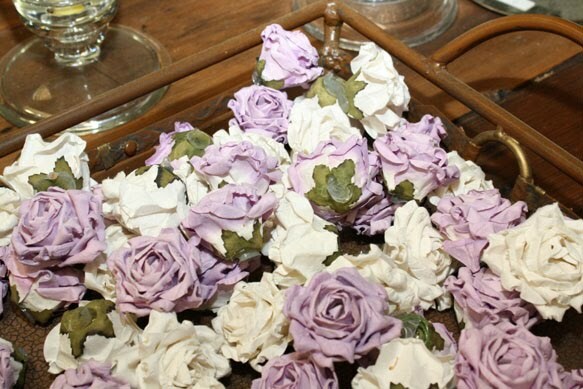 2)If you are buying used old items, expect them to be less than perfect. Especially if the listing says they are. 3) If something is damaged during transit, give me time to make it right, before leaving feedback or making threats. 4) Handling charges include cost of packaging, cost of paypal fees, and listing/selling fees. We sellers are nickle and dimed to death. 5)Communication, communication, communication is essential to a smooth transaction. 6)Read the listing fully, many issues are covered there. ie how long to pay, shipping charges etc. Ask questions before bidding. 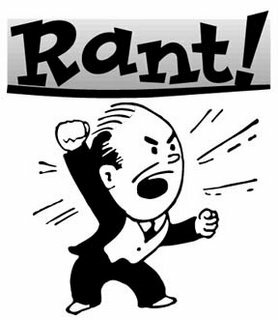 7)If you feel you've paid too much for an item, you should not have bid that amount. It was your choice, nobody twisted your arm. Don't, just not pay for it. 8) Remember this is a business for the seller. It's not personal, just business. 9)Negative feedback hurts. For me it hurts not only my business but my feelings as well. I loose sleep, and time when I get negative. As a people pleaser by nature, it goes against everything that keeps me going. Makes me want to hang my hat and give up. 10) there are bad sellers out there, but I'm not one of them. I promise. I will continue using e*bay and holding my nose while doing so. I guess I've got to put on the nice nice gloves when trying to collect payments and deal with folks who don't like what they bid on, so that I protect my feedback rating. Oh and in addition, they've raised their selling fees to 10% across the board. Ouch!!!!! Getting down from soap box now. When is a basket a table?????? This is one of the items I got at the Gresham Barn Sale, I loved this basket's shape, and the part that folds out and in at the top. I think it was a ball basket for sports, but I'm not sure. 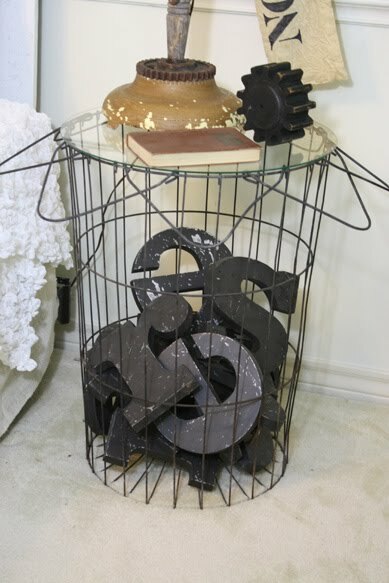 Now it's a side table. Old sign letters look great inside. If you haven't yet, pop over to Ki's blog and see a great project for old wooden Hangers. This one has to go in my top 10. Even though I've been busy busy this past week, I always have time to stop by my favorite picker's places to see what they have found for me. 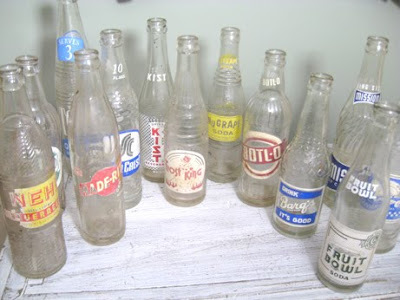 This week I got this great lot of vintage soda bottles. Cool! makes me thirsty for an old fashioned cold soda pop. I'm still working on cleaning them, and I have a project in mind if I can make it work. This Ain't No Ordinary Barn!!!!! 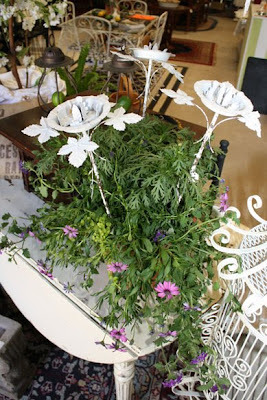 Here are a few pictures from the Gresham Barn Sale. Sale started last night and will continue through Saturday. Ya'll come on out, there is lots left. This ain't no ordinary Barn. Jodi's got several of these bed spring wreaths. as is the wonderful old sign below. If you haven't made it out yet, you've got 2 more days. There is no better place to be tonight than the Gresham Barn Sale. It will be Beau-ti-ful when you arrive tonight. This year, Jodi's daughter is getting started as the little entrepreneur with her very first lemonade stand , so come thirsty! Janie's cake served until their gone! Cookies from Cookiecrumbsyum, Jodi's sweet aunt's book for sale with her available to autograph it, soaps and candles from Essentially Naked, Margo's type letter pendants and TONS of other great treasures!